"They arrived at Hanbridge Railway Station, which was a tempest of traffic that Saturday before Bank Holiday. The whole of the five towns appeared to be going away." Arnold Bennett - "Under the Clock"
The purple line running of the loop line was the original line from Etruria into Hanley opening to goods on the 20th of December 1861 and passengers on the 13th of July 1864 - nearly 10 years before the loop line proper opened from Hanley to Burslem and then on through Tunstall to Kidsgrove. 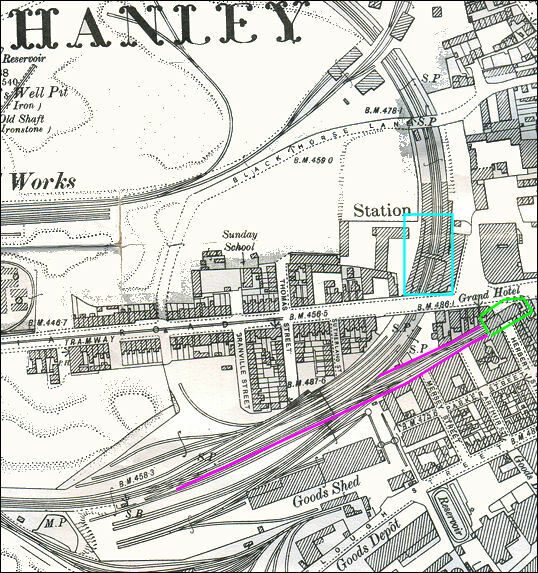 This original line terminated in a station on the south side of Trinity Street (shown in green) - on the opposite side of the road from the Grand Hotel. A price of £1,600 was submitted in June 1872 for the new Hanley station alongside the Grand Hotel - this was though to be too much and by reducing the length of the covered roof the cost was reduced to £1,200. 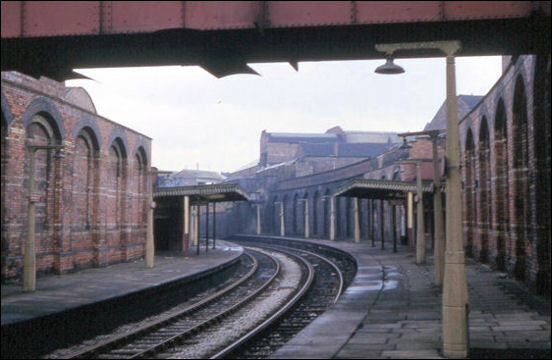 - the track on the near right is the original line terminated in a station on the south side of Trinity Street. 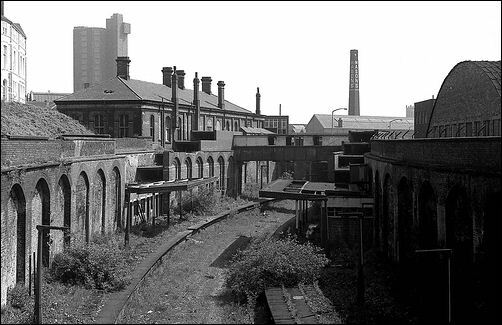 Hanley station "in a deep cutting and on a very sharp curve"
The curve was on a very tight 175 yards radius which limited the size of locomotives which could run on the loop line. photo looking towards Hanley, a small part of the Grand Hotel just visible on the left. 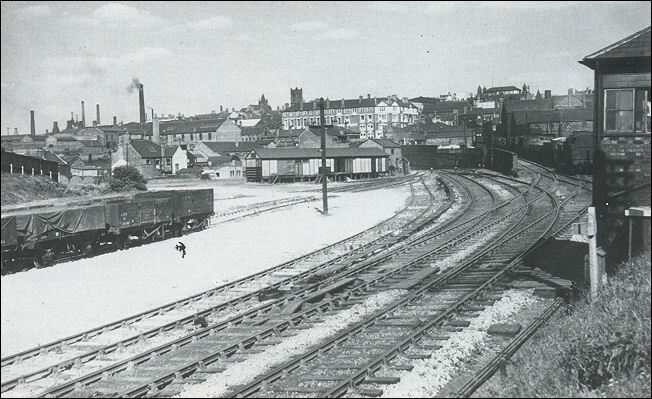 The newly build civic centre - Unity House can be seen - below Unity House are the Goods Sheds on the opposite side of Trinity Street. The chimney of Masons pottery works on Broad Street can also be seen.